Prior to your session, please check program to determine the number and order of the abstracts to be presented, and the time allocated to each abstract. If possible, we kindly ask chairs to arrive at the session room about 20 minutes prior to the start of the session. Please start the session on time - Many attendees move from session to session in order to hear specific abstracts. For Invited lectures, including symposium and other related sessions, allocation of time for each presentation is left to the discretion of the chairs. Symposia: for each presentation is left to the discretion of the chairs. Please prepare your data in Microsoft PowerPoint (Windows PowerPoint 2007/2010/2013） and make sure to preview your presentation data. Data Preview: Please come to “Data Preview”, located on the 3rd floor Foyer area in Pacifico Yokohama. We kindly ask all presenters to check in data at least 60 minutes prior to your presentation. Your media should contain only the presentation data for the Congress. Windows7 is the only operating system available for the presentations. If your presentation contains any movie files, you are also requested to bring your own computer. If your presentation data is linked to other files (i.e. still or moving images, graphs, etc. ), those linked files should also be saved in the same folder, and the links checked beforehand. Please visit our “Data Preview” room, before your session to test your data including video files. You are requested to leave your computer to our skilled technicians in the session room at least 10 mins before your presentation starts. Please bring your AC adapter with you. Please make sure to unlock your password on your computer. Posters will be displayed in the Exhibition Hall B. The panel size is shown in the figure on the right. 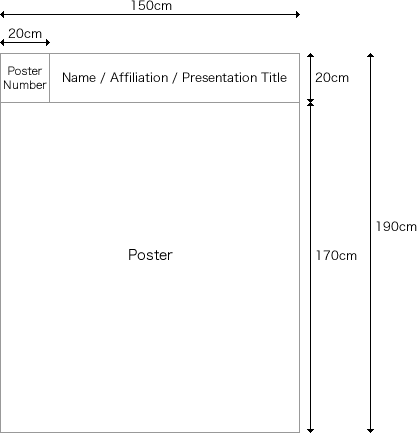 * Although there will be a 30cm margin in between each panel, this space should be kept clear for the presenter to stand in front of his/her poster. Posters therefore cannot be displayed in this area. Please print out the title of your presentation as well as the presenter’s name/s and affiliation in English and affix this information at the top of the poster display space. Poster must be prepared in English. Please mount your poster in the position indicated by the “poster number ”within the designated mounting time. The poster number consists of the last three digits of the presentation number. Poster numbers are already indicated on display panels. Please check your presentation session number and poster display number and make sure you mount your poster on the correct panel at the correct time of day. Tacks for putting up posters will be placed in a paper cup attached to each poster panel. Please do not use glue or scotch tape. Please attach the ribbon on your chest and stand in front of your poster panel during the presentation and discussion period listed above, and respond to participants’ Questions (there will be no chairperson moving the sessions along). Posters will be changed every day. Please help by taking your own poster down. If a presenter finds his/her poster location still occupied by a poster from the previous session, please remove it, place it on the floor and set up your poster in the space. If you cannot remove your poster during the designated removal time, please take it down straight just after the presentation time. Posters remaining after the removal period will be removed by the Secretariat. The Organizer and Secretariat will accept no responsibility for any theft, loss or damage of posters. About 5% of Japanese men（3 million people）and 8% of Caucasian men have a color vision deficiency, with conditions that affect the perception of colors, including red and green. We kindly request to take the following points into account when preparing presentation materials. Images of two-color staining or DNA chips should be displayed in green and magenta, not red and green. In graphs and explanatory figures, it is extremely difficult to match colors shown in two separate places. For this reason, please indicate not only color-coded descriptions or legends for different items, but also write them directly into figures. In addition, please use not only colors but also types of line, shapes of symbol and types of hatching so as to facilitate their distinction in each item. On a dark background, please use white, yellow, orange letters without red ones and blue thin ones as far as possible. For further information, please see http://www.nig.ac.jp/color/.